His Holiness Patriarch Mor Ignatius Aphrem II attended the Choir Concert at the spiritual night prepared by Mor Eliyo Church in Geissen. 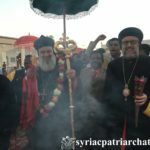 Their Eminences Archbishops Mor Philoxenus Mattias Nayis, Patriarchal Vicar in Germany, Mor Dioscoros Benjamin Atas, Patriarchal Vicar in Sweden and Mor Julius Hanna Aydin, Director of Foreign Relations in Germany, were also present. 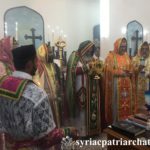 The choirs of the four Syriac Orthodox parishes in Geissen offered hymns and national songs in Syriac. In his speech, His Holiness spoke about the meaning of the consecration of the church and explained that it is to dedicate a building so that it becomes the house of the Lord where faithful meet and pray. He also spoke about the necessity that the faithful be renewed in the spirit when they experience a consecration. 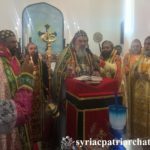 His Holiness Patriarch Mor Ignatius Aphrem II presided over the Evening prayer (Ramsho) at Mor Eliyo Church in Geissen. 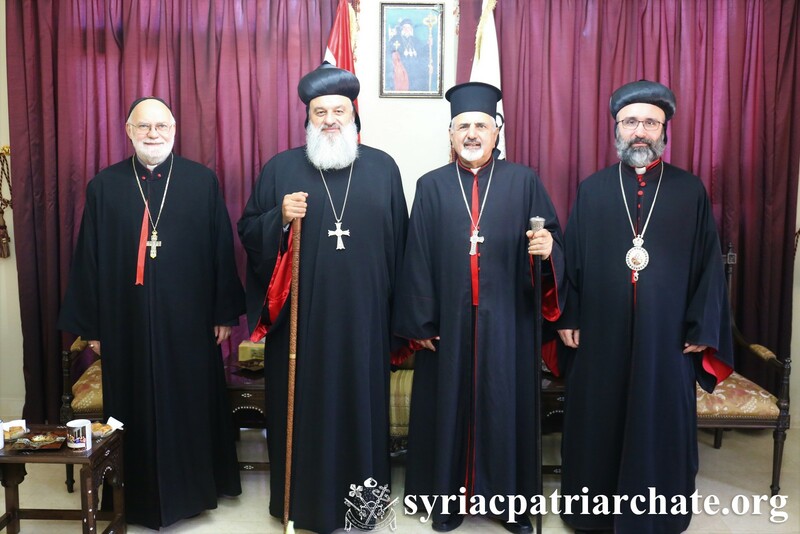 Their Eminences Archbishops Mor Philoxenus Mattias Nayis, Patriarchal Vicar in Germany, Mor Dioscoros Benjamin Atas, Patriarchal Vicar in Sweden and Mor Julius Hanna Aydin, Director of Foreign Relations in Germany, were also present. At the end of the prayer, His Holiness blessed the deacons all the faithful who participated in the prayer. His Holiness Patriarch Mor Ignatius Aphrem II met with the newly appointed Archdiocesan Council of Germany, at his residence in Germany, in the presence of His Eminence Mor Philoxenus Mattias Nayis, Patriarchal Vicar in Germany and Chair of the Council. His Holiness congratulated the new members of the council and encouraged them to work together with His Eminence the Archbishop for the best of the Archdiocese. His Holiness Patriarch Mor Ignatius Aphrem II celebrated the Holy Qurobo on the occasion of the Feast of the Ascension of the Lord Jesus Christ to Heaven, at Mor Georges Patriarchal Cathedral in Bab Touma, Damascus. 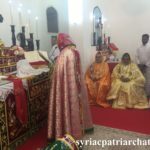 He was assisted by His Eminence Mor Timotheos Matta Al-Khoury, Patriarchal Vicar for the Patriarchal Archdiocese of Damascus. In his sermon, His Holiness spoke about the promise of our Lord to His disciples that He will not leave them orphans, but will send the Holy Spirit. He also spoke about preaching the Gospel to the whole world, and the laying on of hands he gave to them. During the Qurobo, His Holiness conducted the special service on the occasion of the Ascension and blessed the faithful. 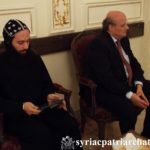 His Holiness Patriarch Mor Ignatius Aphrem II received His Excellency Eng. 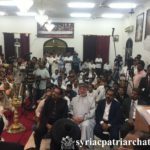 Ahmad al-Qadri, Syrian Minister of Agriculture and Agrarian Reform, at the Patriarchate headquarters in Bab Touma in Damascus. During the meeting, His Holiness discussed with His Excellency the situation in Syria. They also spoke about projects led by the ministry to support farmers and improve the agricultural sector, as well as small projects developed by our church to help the people. 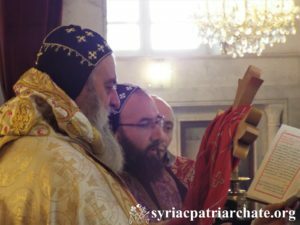 The meeting was attended by His Eminence Mor Timotheos Matta Al-Khoury, Patriarchal Vicar in the Patriarchal Archdiocese of Damascus, Very Rev. Raban Joseph Bali, Patriarchal Secretary, and Media Office Director, Judge Abed Al-Ahad Safar, and Dr. Marwan Azar. His Excellency was accompanied by Dr. Zaki Marqa. 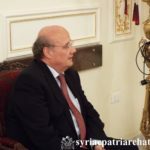 His Holiness Patriarch Mor Ignatius Aphrem II received His Excellency Hans-Peter Glanzer, Charge d’Affaires of the Austrian Embassy in Damascus, at the Patriarchate headquarters in Bab Touma in Damascus. During the meeting, His Holiness discussed with His Excellency the situation in Syria, as well as the presence of our church in Austria. The meeting was attended by Very Rev. Raban Joseph Bali, Patriarchal Secretary, and Media Office Director. 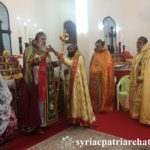 His Holiness Patriarch Mor Ignatius Aphrem II received His Beatitude Syriac Catholic Patriarch Mor Ignatius Youssef III Younan, at the Patriarchal Residence in Atchaneh, Lebanon. 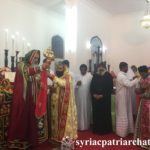 His Beatitude was accompanied by His Excellency Mor Youhanna Jihad Battah, Patriarchal Vicar of the Syriac Catholic Patriarchal Diocese, and Rev. Fr. Habib Mrad, Patriarchal Secretary. 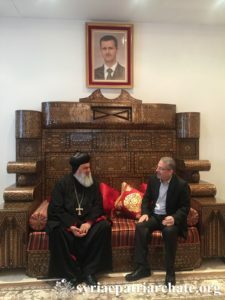 The meeting was also by His Eminence Mor Chrysostomos Mikhael Shemoun, Patriarchal Vicar for the Patriarchal Benevolent Institutions in Atchaneh, and deacon Imad Syryany. His Holiness congratulated His Beatitude for his safe return from his Apostolic visit to the Church in Turkey. 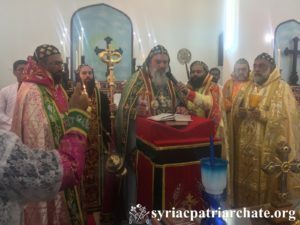 His Beatitude, in turn, thanked His Holiness for the love shown by our Church to His Beatitute and the Syriac Catholic Church in Turkey and throughout the world. They also discussed several church matters related to the church in the Middle East and the diaspora. His Holiness and His Beatitude then made a tour in the new Patriarchal Residence which is being completed. 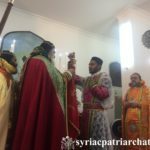 His Holiness Patriarch Mor Ignatius Aphrem II arrived at the Virgin Mary Church in Bourj Hammoud, Mount Lebanon. He was received by their Eminences: Mor Theophilos George Saliba, Archbishop of Mount Lebanon and Tripoli, Mor Philoxenus Matta Chamoun, Mor Justinos Boulos Safar, Patriarchal Vicar in Zahla and Bekaa, Mor Clemis Daniel Kourieh, Metropolitan of Beirut, Mor Chrysostomos Mikhael Chamoun, Patriarchal Vicar and Director of the Patriarchal Benevolent Institutions in Atchaneh, Mor Titus Boulos Touza, Apostolic Nuncio to the Evangelical Churches in Brazil, as well as priests, monks, and deacons of the Archdiocese, and a crowd of faithful. His Excellency General Antoine Pano, newly elected member of parliament, and member of our Syriac Orthodox Church was also present. 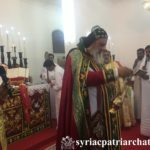 His Holiness entered the church in a procession where he inaugurated the renovated church. 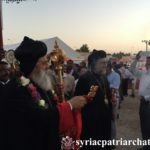 His Holiness then celebrated the Holy Qurobo on the occasion of the feast of Virgin Mary for the blessing of the crops. 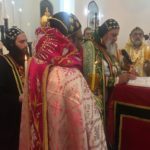 He was assisted by their Eminences Mor Theophilos George Saliba and Mor Chrysostomos Mikhael Chamoun in the presence of their Eminences the Archbishops as well as the reverend priests, monks, deacons and the choir of the parish. In his sermon, His Holiness congratulated His Eminence Mor Theophilos George Saliba and the Archdiocese of Mount Lebanon, especially the parishioners of St. Mary Church for the renovation of their church and making it a house fit for the worship of God. His Holiness spoke about the efforts of His Eminence assisted by the faithful of the parish and he prayed asking the Lord to grant him good health and a long life. His Holiness spoke about the feast of the Virgin Mary for the blessing of the Crops and explained to the faithful the origin of this feast as well as its importance in connecting the Virgin Mary to the faithful on earth. At the time when the earth meant a lot for the peasants, they used to seek the intercession of the Virgin Mary to bless the land and the harvest. His Holiness commented on the Gospel reading affirming that the Lord Jesus Christ loved His mother whom He entrusted to the beloved disciple John. However, the Lord’s reaction to those who told Him that His mother and brothers are asking for Him is a lesson on how to be a mother or brothers to Christ. He pointed out that this requires us to resemble the Virgin Mary in doing the will of God. His Holiness pointed out that most of us fail in this test because we want to do our will and not the will of God. Therefore, we should be more serious in our prayers and truly say and mean: “thy will be done”. 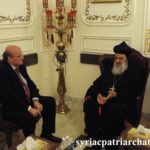 During the Holy Qurobo, His Eminence Mor Theophilos George Saliba welcomed His Holiness in the Archdiocese of Mount Lebanon “your serving Archdiocese which carries your message to Lebanon and the world”. His Eminence expressed his great and indescribable joy for having His Holiness celebrating this special occasion. He addressed His Holiness saying: “You are the Patriarch of Antioch, and the great shepherd of the Syriac church; for four years, you have spent all efforts and are offering what is good for the faithful of this church. You are the heir of great patriarchs and doing great deeds in the service of your people”. 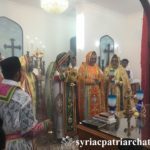 He also spoke about St. Mary Church saying: “This church is the mother church of the Syriac Orthodox parishes of Mount Lebanon since it is the first of the Archdiocese”. 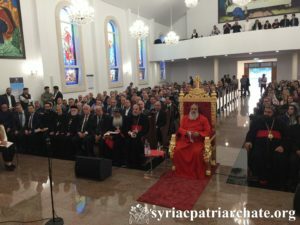 His Eminence thanked His Holiness for his love and thanked everyone who contributed into the renovation of the church. His Eminence concluded his speech saying: “the Fathers of the church teach us that every beginning with God brings about good endings; we started with God and He completed. When God is with us, then who is against us”. 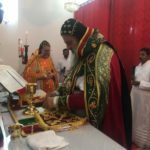 His Holiness Patriarch Mor Ignatius Aphrem II celebrated the Holy Qurobo at St. John Church in Salalah – Oman. 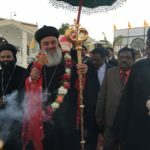 He was assisted by their Eminences: Mor Gregorios Joseph, Metropolitan of Cochin Diocese and Secretary of the Regional Episcopal Synod in India, Mor Clemis Daniel Kourieh, Metropolitan of Beirut, Mor Ireneos Paulose, Patriarchal Vicar of Oman and Metropolitan of Kozhikkod Diocese, and Mor Timotheos Matthew, Patriarchal Secretary for Indian Affairs, attended the Qurobo. In his sermon, His Holiness spoke about keeping the Orthodox faith and love to our Lord and His Holy Church. 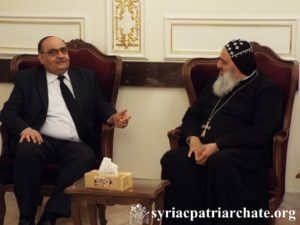 His Holiness Patriarch Mor Ignatius Aphrem II met with His Excellency Mr. Bassam Seifeddin Al-Khatib, Ambassador of Syria to Oman, at the Syrian Embassy in Muscatu upon the invitation of His Excellency. 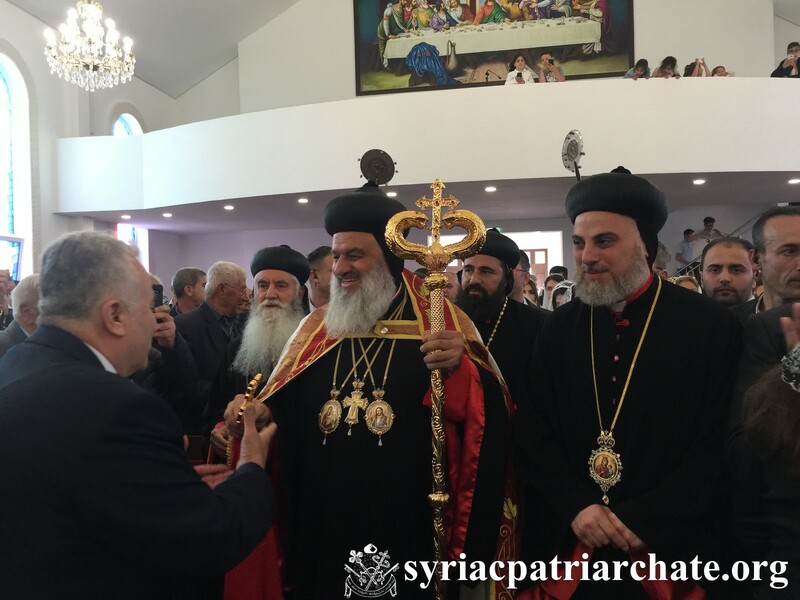 His Holiness was accompanied by His Eminence Mor Clemis Daniel Kourieh, Metropolitan of Beirut, Very Rev. Raban Joseph Bali, Patriarchal Secretary and Media Office Director, and Commander Thomas Alexander. His Holiness discussed with His Excellency issues related to the situation in Syria.